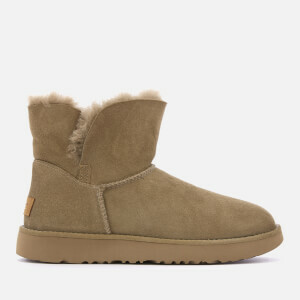 Women's tan sheepskin boots from UGG with a cosy, fleece insole that keeps feet warm and dry. An update on the iconic silhouette, the 'Mini Bailey Bow II' boots have been crafted from pre-treated twinface and suede to resist water and stains for increased durability. Accentuated with a tonal midsole and bow detailing to the rear. Set on a Treadlite by UGG™ outsole and complete with the brand's signature logo to the heel. Upper: Twinface and Suede. Lining: Sheepskin. Sole: Treadlite by UGG™.